The 2018 recipients of the Roy M. Huffington Award for Contributions to International Understanding are two celebrated Houstonians, Dr. Marie and Mr. Vijay Goradia. The couple has made significant contributions to and a global difference in the areas of healthcare, literacy, and education in India. Drs. 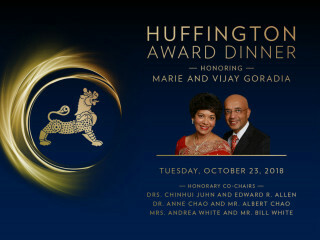 Chinhui Juhn and Edward R. Allen, Dr. Anne Chao and Mr. Albert Chao, and Mrs. Andrea White and Mr. Bill White (former Mayor of Houston) will serve as honorary co-chairs for the 2018 Huffington Award Dinner.